More American children are competing in sports than ever before. 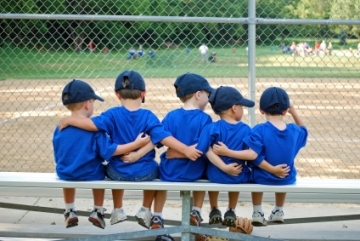 Studies show that sports help children and adolescents keep their bodies fit and feel good about themselves. However, there are some important injury prevention tips that can help parents promote a safe, optimal sports experience for their child. Wear the right gear. Players should wear appropriate and properly fit protective equipment such as pads (neck, shoulder, elbow, chest, knee, shin), helmets, mouth guards, face guards, protective cups, and/or eyewear. Young athletes should not assume that protective gear will prevent all injuries while performing more dangerous or risky activities. Play safe. Strict rules against headfirst sliding (baseball and softball), and spearing (football), and checking in hockey should be enforced.